In order to send and receive email, you will need to install an email client or create an account with a webmail service. There are many email clients to choose from, including several free ones. One of the most popular email programs is Outlook, which is included with some versions of Microsoft Office (it can also be purchased as a standalone program). The latest version of Outlook is Outlook 2003. 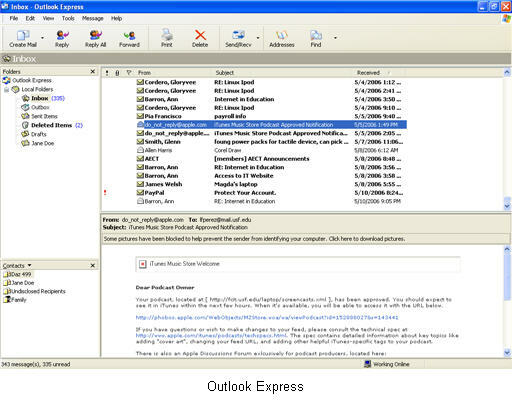 Outlook Express is a more basic version of Outlook that is installed by default with Windows XP. Outlook Express lacks a calendar feature, but it contains all the basic email features of Outlook, including the ability to create an address book. One of the problems of using Outlook Express is that it has been plagued with security problems over the years. 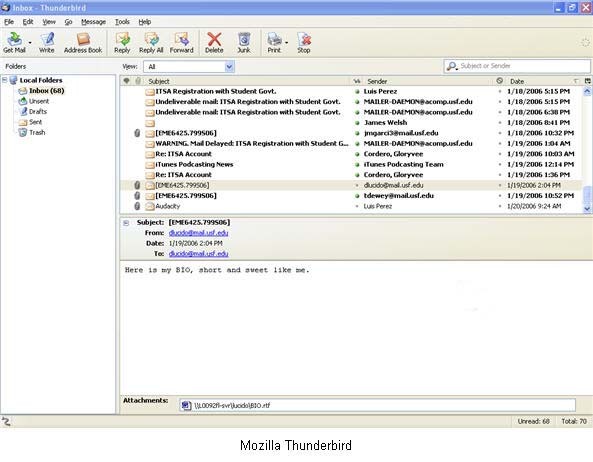 There are other free alternatives to Outlook Express that are more secure, such Mozilla Thunderbird, a free download from the Mozilla Foundation. In addition to using an email client, you can also use webmail to send and receive email. The advantage of using webmail is that you will be able to access your email from anywhere as long as you have an internet connection. Your email is stored on servers owned by the company that provides the service when you use webmail. It is not downloaded to your computer. To use webmail, you open up your web browser and point it to the address of your webmail provider. After you sign in, you will see your email inbox with your messages. You can use links that work just like the buttons in your email client program to send, reply to, or forward messages. Free webmail accounts are provided by companies such as Microsoft (Hotmail), AOL, Yahoo, and Google (GMail). Some webmail providers even provide access for email clients such as Outlook Express and Thunderbird. That way you can set up Outlook Express or Thunderbird to access all of your email accounts using one program. Note that some schools may block email from some webmail providers as a security measure.